Homemade vegetable chips give a good crunch sprinkled over soup – James Martin uses them to garnish his easy parsnip soup. Place all the soup ingredients with the exception of the stock and cream into a roasting tray. Mix well and season with salt and freshly ground black pepper. Place into the oven to roast for 25-30 minutes, until golden and tender. Place all but 250ml/9fl oz of the chicken stock into a saucepan over a high heat. Add the cream and, once boiling, reduce the heat to simmer. Add the roasted parsnips and continue to simmer. Pour the remaining stock into the roasting tray and place over a high heat. Stir well, scraping at the browned bits on the base of the roasting tray to release all of the flavour, then add this sauce to the simmering soup. Remove from the heat and allow to cool slightly, then transfer into a food processor and blend until smooth. Return the soup to the pan and season, to taste, with salt and freshly ground black pepper. Using a potato peeler, peel long strips of each of the vegetables. Carefully add the vegetable strips into the oil and fry until golden. Remove with a slotted spoon and drain on kitchen paper. To serve, place the cream into a bowl and whip lightly until soft peaks form when the whisk is removed. Add the lemon juice and fold into the cream. 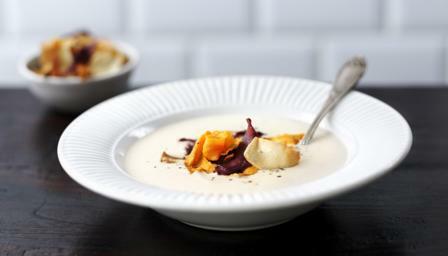 Serve the soup in a bowl with a dollop of cream in the centre and a small pile of vegetable crisps placed over the top. The soup can be frozen or kept in the fridge for a few days. The root vegetable crisps should be stored separately and reheated in the oven just before serving. If you are really short of time you can buy mixed root vegetable crisps from most large supermarkets.